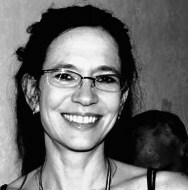 Elizabeth Kadetsky's short stories have been chosen for a Puschart Prize, Best New American Voices and Best American Short Stories notable stories of 2009, and her personal essays have appeared in the New York Times, Santa Monica Review, Antioch Review, and elsewhere. She has been a fellow at MacDowell Colony, Ucross Foundation, Djerassi Resident Artists Program and the St. James Centre for Creativity in Malta. A 25-year practitioner of Iyengar and Ashtanga yoga, she lived in India as a Fulbright scholar and wrote a memoir about her studies with the yogi BKS Iyengar, First There Is a Mountain, published in 2004 by Little, Brown. She is visiting assistant professor in the MFA program at Penn State. Superstition Review: In your career you compose both journalistic and creative pieces. What elements do you employ from one genre of writing, like journalism, when producing creative works? Elizabeth Kadetsky: A lot of my ideas for fiction spring from situations I covered or researched in my career as a journalist—for instance I wrote a story about a kidnapper from Pakistan after I'd been following a story for several years about a real-life figure in India and Pakistan, Omar Saeed Sheikh. When I was reporting in India I'd met someone who had been kidnapped by Sheikh, and escaped. From that moment I was intrigued by who this kidnapper was. Shortly after, the same man was released in a high profile prisoner exchange orchestrated by Osama bin Laden—this was in 1999, before bin Laden was well known in the US. After September 11, the same man—Sheikh—turned up in the news again as the kidnapper in the Danny Pearl case. Initially I wanted to write a piece of journalism about my acquaintance who'd crossed paths with him in that creepy encounter, but an editor at the Times rightly told me that the story would be better told as the survivor's own story. That got me thinking, so I began to imagine the story of a fictional character based on my acquaintance the survivor, which I then wrote from the first person. I recently finished another short story, set in Guatemala, based on a case that I knew about when I'd been covering unsolved murders of American citizens in that country, in the 1990s, for LA Weekly and the Village Voice. This was about an archaeologist from New York City who had a nervous breakdown and died a mysterious, violent death while staying in Guatemala City for a dig. I had always suspected that while digging he'd turned up a mass grave associated with the military violence—and that he either committed suicide or got murdered because he knew too much. That was conjecture. It can be satisfying to be able to build a sensical narrative around nonsensical and unsolved political mysteries. Real life events help me bring coherence to my own writing in fiction, which for me often starts from an image or a feeling, and is therefore not naturally linear or narrative. In a sense, I learned plot from journalism, or in particular from long-form, investigative journalism, which always follows from a question or a mystery—it's a whodunit in a sense. Learning fictional plot from nonfiction is ironic, because Tom Wolfe and the promoters of New Journalism in the1960s and 70s liked to talk about the supposedly ground breaking notion that journalism could borrow the notion of narrative-storytelling from fiction. It's my journalism, versus my fiction, that has always started narratively, on the contrary. SR: Once you have a particular topic or story you want to relate, how do you determine in which style to write it? EK: It really happens on its own. I often start with a situation, whether it's fiction or nonfiction, and from there build to voice and setting. The actual content often arises organically out of those. To be more concrete, I wrote out notes for a short story (still unfinished) a while back about a woman who steals things from people's apartments—I got the idea when I was doing laundry in a friend's basement. I began to imagine all kinds of awful scenarios that could arise if someone did laundry in someone else's house without their permission. Once I started writing I found myself describing the world of the building where I grew up in New York City—fictionalized. That story is still in progress. But the funny thing is, in the meantime I was writing material set in that same building for my memoir-in-progress, about my mother. I wrote the two pieces about six months apart. I recently looked at them side by side and realized that I'd used exactly the same details, but skewed them completely differently. For the memoir this material was about trying to bring across the world of New York City at a particular historic moment. The voice was unrelated, and so the overall style, and what it meant, felt very different. For me, there is something very fundamentally different in terms of fictional versus nonfictional stance. This was an example of writing the same material in both genres and seeing it take on two completely ulterior lives. I am a writer who finds myself preoccupied by the same material over and over. It keeps coming up again, in new forms and styles and toward different narrative ends. SR: Please explain the significance of the title to your 2004 novel, First There is a Mountain. EK: Thanks for asking, no one ever asks! People always hum the song—by Donovan, circa 1968, “First there is a mountain / Then there is no mountain / Then there is…”—but rarely does the conversation go further. When I came up with the title I did not actually know the song, which is apparently well known to an older generation. I was brainstorming with a friend. I'd decided I wanted to use the word “mountain” because I liked the solidness of the imagery, and because in the book and in yoga the first pose is “mountain pose,” or tada (mountain)-asana (pose) in Sanskrit. We were coming up with “mountain” expressions: You can't bring the mountain to Mohammed, Don't make a mountain out of a molehill, The other side of the mountain, and I kept saying, “First, you go to the mountain,” and things like that. My friend said “First There Is a Mountain!” “Right!” I said. Then he sang the lyrics. The Donovan song comes from a Zen saying. I was disappointed that the expression wasn't Hindu, but the meaning perfectly reflected the three-act structure I had tried to construct for the book, a tale of moving from illusion, to disillusion, to coming to terms, which in a sense is the trajectory of all great stories. SR: First There is a Mountain relates not only a spiritual journey through yoga practice but also “something more: a memoir, a love story…” as described on your website. Along with yoga, how did writing about your experiences assist this spiritual journey and self-discovery? EK: These are great questions. Thanks for this careful thought about the work. After I competed the book I had the opportunity to learn about Post-Traumatic Stress Disorder and how to treat it. In reading up on the topic I discovered that it is widely believed that victims of trauma can achieve healing by constructing a narrative out of events, which otherwise seem to them irrational or nonsensical—violence, or betrayal, events that you can just not make sense of, how any human could commit such acts. Traumatic memories are often fragmented, non-linear, irrational—because the acts that gave rise to them don't make sense to the victim. Building them into a story gives them coherence, and helps the sufferer move on from them. First There Is a Mountain does not concern specifically traumatic events, but it does chronicle a difficult period of my life. It feels cliche to say that the act of writing it down helped me put it behind me, but it did. To write about it I had to get distance from it, to see myself as a character, in a sense, living in a universe that was like a fictional, created universe—though of course the events are entirely nonfictional. Also, for the purpose of the book the story had to have an ending. Writing this ending convinced me that the era of my life covered in the book was, you could say, a closed chapter. SR: How did your training in journalism prepare you for collecting and documenting information on the practices of Eastern yoga? EK: I attended Columbia University's Graduate School of Journalism, where I later taught on faculty. I now believe that the primary strength of that very impressive program is in teaching an ethos, the journalistic ethos, a worldview possessed by very few people who are not journalists (or New Yorkers!). Columbia's “boot camp”approach teaches the journalist-in-training to understand that there is no question that cannot be answered. This is a conceit, false in many ways, and problematic in some (i.e., it can breed intellectual arrogance, which when coupled with superficiality can be a dangerous thing). This is a roundabout way of getting to the point that Indian thought doesn't make sense. Cognitive dissonance is required to apprehend Indian society—its disparities, it rationalizations, and its complex philosophies. My training as a journalist gave me the hubris to believe that by reading, interviewing and studying I could understand. In the long run I couldn't, but I learned a lot, and also, I was able to write about a complex reality from a position of humility and awe, and some learning. SR: In First There is a Mountain you write that you when you traveled to India you did not find the version of yoga to which you had been accustomed in the United States. How has your yoga practice evolved since writing this memoir? EK: My last week in India during the year I lived there as a Fulbright scholar, I stayed in a little hut on the grounds of the Krishnamurti Foundation in Chennai. I had stayed at a lot of ashrams and yoga schools, and this one was similar in feel, but in some ways the experience crowned everything I learned while on that journey. Jiddu Krishnamurti wound up breaking from his traditional Hindu upbringing by joining the East-West cult of Theosophy, and then he split from Theosophy and became a philosopher of singular mind. I went there to read his papers and writings on yoga, about which he was an adherent, but also ambivalent. Someone I met there described Krishnamurti's understanding of yoga like this: “It's a kind of hygiene. It's like brushing your teeth. You do it, it's personal, and you must. But it's nobody else's business.” In my book, I wrote about how I left BKS Iyengar's school and began training with a close protege of Iyengar's lifelong nemesis, Pattabhi Jois. Later I went on to study with Jois himself, which Iyengar and his followers considered a betrayal. I did a lot of readings after my book was published wherein the Q&A someone would demand that I defend this betrayal. I believe that what you do with your body is a personal choice, and no one's business. I'd say that it's like choosing your toothpaste. SR: For what seems such a personal and private experience in India, what prompted you to relate it for a public audience? EK: Another great question, I love this question. At an early stage in my training in yoga I had to make a choice—writer or yogi. The yogi seeks to eliminate the “veils of difference” between himself and the cosmic universal (according to Patañjali's yoga sutras). The writer does the opposite. The writer, or artist, uses artifice to construct a persona from which to tell a story. To illustrate this more concretely, when I was working on the book, I was often in the position of making a choice: would I fully inhabit the experience—which is the very goal of yoga itself—or would I maintain a writerly distance in my head in order to articulate the nature of the experience to myself and then later write it down. In the end I gave in. I cared more about being a writer. I was willing to compromise the essential integrity of the yoga practice in order to attempt to communicate what it was like. SR: In your October 2009 New York Times article, “The Art of Defying Death,” you relate that “yoga, and other things, gave me the mental clarity that saved my life in that moment. And I also believe that my training helped me survive in other ways, in the aftermath.” As yoga helped you overcome the trauma of being attacked in your home, how does writing compare to yoga as a discipline and practice? How can the two complement each other in working through challenges? SR: Many of your short stories occur in another foreign country—this time in Mexico. From your travels in India and Mexico, what are some of the challenges of describing a foreign country's customs and culture for an American audience? EK: I suppose the writer has the choice of doing the Bowles thing or doing the Forster thing—which is reductive and a false dichotomy, of course. Paul Bowles was interested in pointing out moments of Western arrogance and misunderstanding, which in the end, in his stories, caused his Western travelers to invite their own ruin. E. M. Forster was more interested in intrigue, mystery, and a romantic interaction with Other. I am more drawn to the former. I found myself the journalist in India possessed with a false sense of confidence: by spending a year reading histories and novels written in and about India, I could deeply “understand” this place, or so I believed. In the end, I can do more to show the American reader the cultural arrogance that is our heritage. I can show myself—or a doppelganger American traveler—whose tics and American-ness are highlighted in a foreign setting. This is hopefully more illuminating, illuminating of ourselves, than anything I could instruct about India or another foreign culture. SR: You are currently the visiting MFA faculty member in creative nonfiction at Penn State University, and you have also spent time at other universities teaching courses. Please discuss what you enjoy most about teaching writing. EK: It's a great job. I like it when my students surprise me. I recently learned that one of my best and favorite undergraduate students is a born-again Christian. I had no idea. Where I come from—Manhattan—this is very exotic. Her writing was struggling with very specific aspects of what it means to seek an authentic existence in a material world. This is so universal. It was wonderful to be reminded that the grand themes that have preoccupied me and that I have seen echoed in my travels in many places across the globe are equally relevant and might turn up in unexpected moments close to home.